Since 1999, the non-profit Kalmia Club of Lambertville has awarded annual scholarships to graduating women of South Hunterdon Regional High School. The woman’s civic organization’s Community Outreach Committee meets each applicant and reviews their community service experience and leadership activities along with an essay. This year, along with funds from the Hidden Gardens of Lambertville Tour, the club raised scholarship money at a benefit dance party held at the Elks Club and dedicated to the memory of Tina Ledger. In addition, a generous yearly contribution is made by Dr. Mehmet Unsal Calis, in memory of his mother, Hatice Calis. Pictured by Kalmia sign, from left, the 2017 Kalmia Club scholarship recipients: Diana Martinez, Victoria Dennison, back, Alexis Murray and Haley Kowal. Missing from photo: Carly Leary. Every year, the Kalmia Club of Lambertville awards deserving juniors from South Hunterdon Regional High School a chance to attend a week-long stay at Rutgers’ Douglas College to experience college life by living in a dorm, attending lectures and workshops to learn about career choices and networking with other delegates from all over NJ, often establishing lifetime friendships. This year’s recipients are, rear, from left: Chris O'Donnell, Kalmia Outreach Committee Chair; Tami Hettman (Carissa's Hettman’s mother); Carissa Hettman, GCI Delegate 2017; Cynthia Serrance (Katie Kraska's mother); Katie Kraska, GCI Delegate 2017; DeAnna Young, GCI Delegate 2017; Leticia Young (DeAnna Young’s mother); Donna Lacey, GCI Coordinator and Kalmia Outreach Committee ; and in front, Layla Young (DeAnna's sister and Kalmia's top pick for future GCI Candidate 2029). 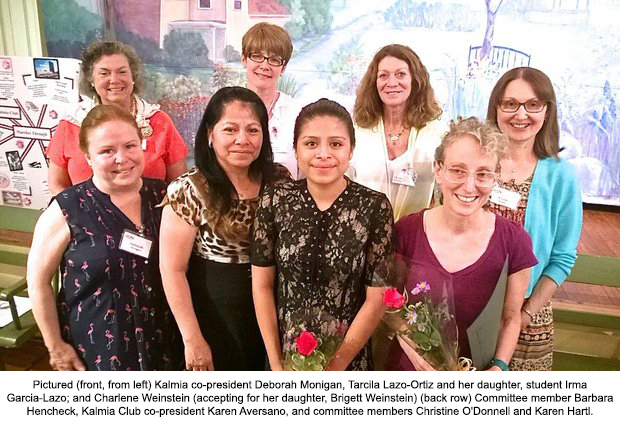 The Kalmia Club of Lambertville, a women's non-profit civic organization, recently awarded $1,000 scholarships to South Hunterdon High School students Irma Garcia-Lazo and Brigett Weinstein, who were chosen by the club's scholarship committee from a pool of applicants. 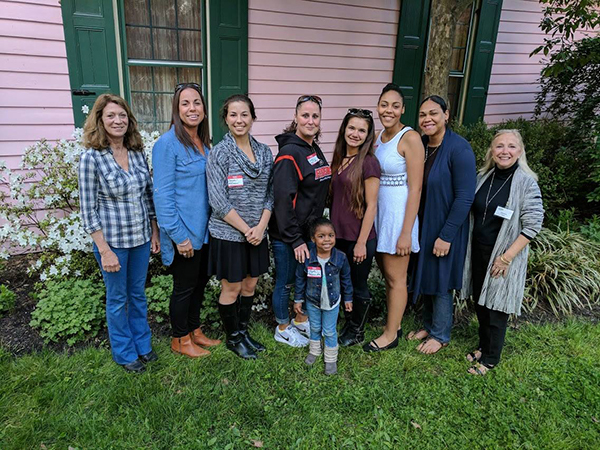 The club rewards scholarships each year to local young women from money raised, in large part, through sales of tickets to the club's annual Hidden Gardens of Lambertville tour. 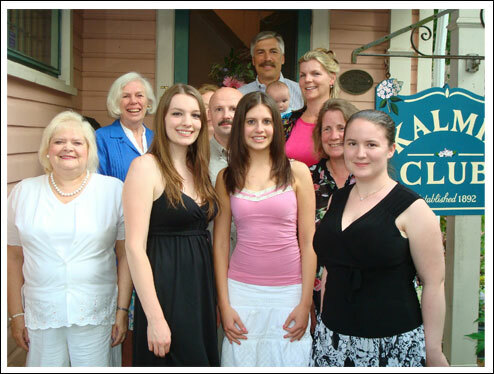 Left Photo: Since 1999, the non-profit Kalmia Club of Lambertville has awarded annual scholarships to graduating women of South Hunterdon Regional High School. 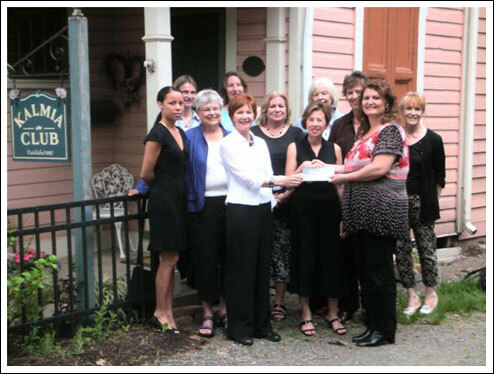 The woman's civic organization's Community Outreach Committee meets each applicant and reviews their community service experience and leadership activities along with an essay and then dedicates a portion of money raised during its annual Hidden Gardens of Lambertville tour to awarding four scholarships. Pictured, from left, the 2015 recipients: Elyse Williams, Julia Greenwood, Alana Kilcoyne, scholarship committee member Barbara Hencheck and Cori McClelland. Right Photo: Every spring, the non-profit Kalmia Club of Lambertville awards deserving juniors from South Hunterdon Regional High School a chance to attend a week-long stay at Rutgers' Douglas College to experience college life by living in a dorm, attending lectures and workshops to learn about career choices and networking with other delegates from all over NJ, often establishing lifetime friendships. This year's recipients are, rear, from left: Susan Laird, of the SHRHS guidance department; Donna Lacey, Kalmia Club Outreach Committee member; and student Carolina Restrepo. Front, from left: students Saidah Lerman and Karina Sanchez. 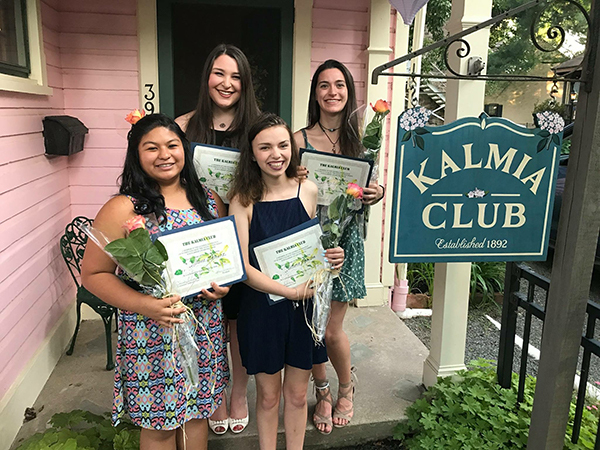 The Kalmia Club of Lambertville, N.J., recently presented scholarships totaling $2,000 to three area high school seniors. The scholarships were presented during the Club’s Old-Fashioned Picnic in the Park where the organization celebrated the 100th Anniversary of its historic clubhouse in Lambertville. 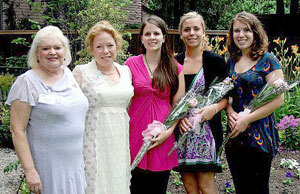 Pictured here from left to right are scholarship presenters and Kalmia Club community outreach committee members, Barbara Stires and Sue Fox; and scholarship recipients Carrie Beth Hornberger, who will be attending Drew University; and Leslie Salsbury and Hailee Kerr, who will both be attending The College of New Jersey. The Kalmia Club’s scholarship funds are raised from the Club’s annual Hidden Gardens of Lambertville Tour held in June. Read the story that was featured in the Beacon here. LAMBERTVILLE, N.J. – At the June 8, 2009 meeting of the Kalmia Club, three graduating seniors from South Hunterdon Regional High School were awarded scholarships, two members were honored for 50 years of service and new officers were installed. Hannah Brady, daughter of Polly Anderson and Kevin Brady of Lambertville was awarded the $500 Polly Dorman Memorial Scholarship. Hannah will be studying Theatre Studies and Musical Theatre at Montclair State University. Hannah has been a member of the school’s Key Club, REBEL, FBLA, South Hunterdon Chorus Council and Student Senate. She has served on the prom committee and the National Honors Society, is an editor of the South Hunterdon Yearbook and co-founder and President of the International Thespian Society at South Hunterdon. Hannah has also been a counselor for 6th grade students at Fairview Lake Camp. Molly Bob, daughter of Debbie and Jonathan Bob of West Amwell was awarded a $1,000 scholarship. Molly will be studying Education at Caldwell College. Molly has participated in Habitat for Humanity, was one of the two captains for the varsity football cheerleading squad and a volunteer cheerleading coach for the Lambertville Ramblers flag football cheerleading squad. Allison Coleman, daughter of Bridget and Curtis Coleman of Lambertville was awarded a $1,000 scholarship. Allison will be studying Communications/Journalism at Kean College. Allison has volunteered with Race for the Cure, Relay for Life and various FFA activities and participated at the LAEF Dinner as a server and Alter Server. Each year, scholarship funds are raised from Club activities such as the Hidden Gardens of Lambertville tour and “Nightclub at the Riverside.” The Scholarship Committee members this past year were Sue Fox and Barbara Stires, Co-Chairs; Jena Dillon, Elizabeth Griffin, Bambi Kuhl and Donna Lacey. Janet Hunt and Bernice Farlee Snyder were both recognized for their 50 years of service to the Kalmia Club and were presented with certificates from the New Jersey State Federation of Women’s Clubs of GRWC as well as 50-year pins to commemorate the occasion. The following officers were installed for the term 2009-2011: Fran Bardusco and Millie Fischer, Co-Presidents; Benedetta Lambert, Vice President; Brenda Probasco, Treasurer. Newly installed members of the Board of Trustees are Johanna Cushing and Karen Rohne Todd, serving three years ending 2012. Left Photo: Kalmia Club scholarship awards went to Allison Coleman, Hannah Brady and Molly Bob (front row, left to right). Back row are Community Outreach Committee members: Co-Chair Barbara Stires, Donna Lacey, Co-Chair Sue Fox and Jena Dillon. Right Photo: Outgoing Co-Presidents Johanna Cushing (far left) and Karen Rohne Todd (far right), celebrate with Janet Hunt and Bernice Farlee Snyder both of whom have served the Kalmia Club for 50 years. 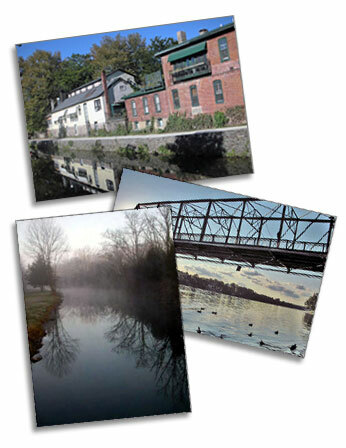 In order to benefit The Kalmia Club's Scholarship Fund, the club is selling beautiful, scenic notecards with original photography of Lambertville, New Jersey. The photographs were taken by Herb Spiegel and Kalmia Club member, Jane Wesby. A package of 8 Cards (with 4 photos) is only $15.00. For more information, or to order notecards, please contact Jane Wesby at janeswesby@gmail.com or 609-397-6637. The Kalmia Club was pleased to present $1,000 scholarship awards to Bryn Hoyer, Nicole Case, and Pennie Scesney (pictured L-R with their parents and a few members of the Kalmia Scholarship Committe), all graduating seniors from South Hunterdon Regional High School. Nicole will be attending East Carolina University in Greenville, NC, where she will pursue a degree in Art Education. Nicole was captain of the South Hunterdon Field Hockey team for the 2007 season and senior yearbook editor for the 2008 yearbook. She also volunteered at the Bucks County SPCA, the Mt. Airy Presbyterian Church Bible Camp, was a member of SADD (Students Against Destructive Decisions) and PYPM (Protecting You Protecting Me). Bryn will be attending Bucks County Community College studying for an Associates Degree. She has given horseback riding lessons to children and young adults and became barn manager of the facility where she worked. Bryn volunteered in soup kitchens in Philadelphia, at a children's home in Kensington and raised money for orphans in Uganda. Pennie Scesney will be attending the University of Hartford where she will major in Performing Arts Management. Pennie belonged to three community-based groups: REBEL, SADD and the Key Club. She was also Captain of the Color Guard and head stage manager for the high school musical. Pennie will be taking an EMT course in July to become a full member of the Lambertville-New Hope Rescue Squad. 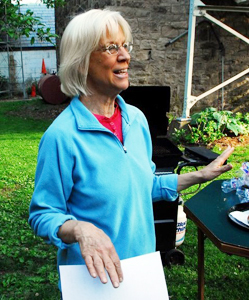 Scholarship funds were raised from Club activities such as the Hidden Gardens of Lambertville Tour, which is held annually the second Saturday of June, and a special contribution to this year’s scholarship fund made in honor of member Bernice Farlee Snyder. Realtor Donna Lacey, now of Lisa James Otto Country Properties, donated $500 from the 2007 sale of Ms. Snyder's house to the fund. The Scholarship Committee members are Elizabeth Griffin and Carole Sue King, Co-Chairs; Joan Berna, Jena Dillon, Sue Fox, Donna Lacey, Bambi Kuhl, Leigh McKay, and Barbara J. Stires. The Kalmia Club of Lambertville recently presented a donation of $5,200 to SAFE in Hunterdon. The money was raised at the Kalmia Club’s “Nightclub at the Riverside” event held at The Lambertville Station in March. Presenting the check to the incoming Executive Director of SAFE in Hunterdon, Kimberly A. Spangenberg, MS, second from right; are members of the event committee: Jena Dillon; Suzanne Gitomer; Karen Todd, co-president of Kalmia; Beverly Kershaw, Johanna Cushing, co-president of Kalmia; Jane Wesby; Naomi Drew, Chairwoman; Leigh McKay; Carol Heffler and Maryann Ranson. Committee member Mila Montemayor was not available for the photo. Click here to view past outreach programs.